The Project Tracker is back! With so much planned at Disneyland over the next few years, it was time to start fresh with a new Project Tracker. So, we've totally refreshed the tracker and have gone through it project-by-project to bring you the latest and most up-to-date listing of the latest goings-on and rumors at the Disneyland Resort. As always, we've cited as many of our sources as possible throughout the project entries, although some information comes directly from our own anonymous sources. Feel free to join the discussion and share your thoughts, photos, and information here! Have something to share? Email us at datelinedisneyland@micechat.com. DETAILS: The Disneyland Railroad will close for roughly 15 months starting January 11, 2016. The closure will put the entire railroad route out of commission while a large section of the route in Frontierland is permanently re-routed to accommodate Disneyland's upcoming Star Wars-themed expansion. Disney confirmed the closure in a September 2015 blog post. New RFID-based admission media (tickets and Annual Passports) in lieu of MagicBands. Central Fastpass+ reservation centers in both theme parks. Interactive queue enhancements for select E-Ticket attractions. The implementation of MyMagic+ has been long-rumored for Disneyland and has gone through multiple changes. Testing has been seen during May 2016 and early signs of permanent implementation have been spotted. DETAILS: The Jungle Cruise will close starting January 11, 2016 to remove its annual holiday overlay and will remain closed through early May for an extended refurbishment, the dates of which have been released to Cast Members. The extended closure is rumored to include the addition of doors and other safety features to the jungle boats and loading dock. The safety enhancements are installed and in use but did not include the rumored addition doors on the jungle boats. DETAILS: With Frontierlnad's Big Thunder Barbecue restaurant closing to make way for Star Wars, Disneyland is rumored to be considering a permanent revival of the Tahitian Terrace restaurant in Adventureland. The much smaller facility would ditch its long-unused Aladdin theme and once again host table service Polynesian-themed dinner shows. DETAILS: Disneyland's iconic Rivers of America will close for over a year to be reduced in size and "rerouted" to make way for the new Star Wars expansion coming to northern Disneyland. The project will result in long-term temporary closures for the following attractions, all of which are expected to return following construction. Rivers of America closed at the end of the operating day on January 10, 2016 to begin work that will take approximately 15 months to complete. Big Thunder Ranch and related attractions and facilities closed at the end of the operating day on January 10, 2016 and were soon removed. The space will reopen as part of the Star Wars expansion. COMPLETION DATE: Star Wars expansion expected to open late 2018. DETAILS: The popular Fantasmic! show will close for over a year starting January 11, 2016 while the Rivers of America is reduced in order to accommodate Star Wars. Due to the closure and River changes, the show is rumored to reopen in 2017 with enhancements and some necessary re-staging. Disney has confirmed Fantasmic! will go dark as part of the Rivers of America changes but has not confirmed any enhancements to the show. COMPLETION DATE: As late as July 2017. DETAILS: With the Rivers of America being reduced to accommodate the upcoming Star Wars expansion, space could be carved out to build a permanent guest pathway connecting Critter Country to the Star Wars-themed area. OPEN DATE: When the Star Wars expansion opens. 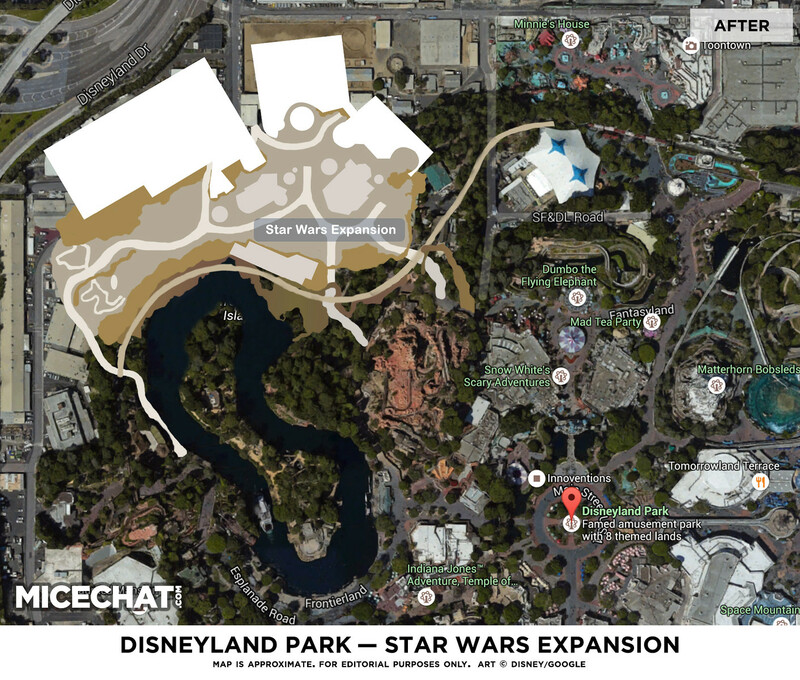 New 14-acre Star Wars-themed expansion. 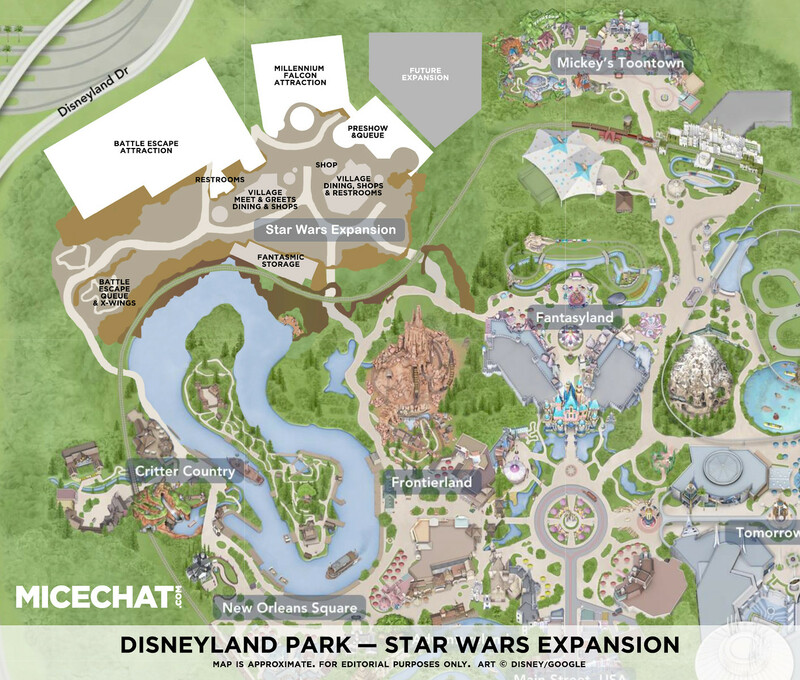 DETAILS: The long-rumored Star Wars-themed land was officially announced at the 2015 D23 Expo. The land will occupy space currently occupied by Big Thunder Ranch, parts of the Rivers of America, and backstage areas. The new land is expected to include two currently-unnamed major E-Ticket attractions in addition to dining and shopping. Disney CEO Bob Iger announced the 14-acre expansion at the 2015 D23 Expo. Construction began January 11, 2016 with the closure of Big Thunder Ranch and major changes to the Rivers of America and Disneyland Railroad route. Backstage facilities were closed, demolished and be relocated accordingly. COMPLETION DATE: Rumored to open late 2018. Disney has announced the Star Wars expansion but not an opening date. DETAILS: Fantasyland's long-shutted Skyway Chalet building behind the Village Haus Restaurant has been rumored for removal for some time. The building is now rumored to be removed as part of the larger Star Wars expansion, which will absorb the Big Thunder Ranch land immediately next to the structure. Disney filed a permit with the City of Anaheim on May 11, 2016 to demolish the long-abandoned Skyway Chalet. COMPLETION DATE: Unknown, but likely sometime during summer 2016. DETAILS: Due to the Star Wars expansion's re-routing of the Disneyland Railroad, the Fantasyland Theatre will need to be removed to accommodate the train's new route. MiceAge reported Disney plans to remove the Fantasyland Theatre to accommodate the re-routed Disneyland Railroad as part of the larger Star Wars expansion. Disney's official DisneylandToday Twitter account has told fans that Disney currently has no announcements for the Fantasyland Theater, but that is neither a confirmation or denial of plans for the facility. COMPLETION DATE: Unknown, but before Star Wars land is opens. DETAILS: The removal of the Fantasyland Theatre is expected to allow for a modest amount of space for a future Fantasyland expansion. MiceAge reported Disney plans to remove the Fantasyland Theatre to accommodate the re-routed Disneyland Railroad as part of the larger Star Wars expansion. While the removal of the Theatre is primarily to accommodate the new Railroad route, leftover space from its removal is rumored to used for future Fantasyland expansion. 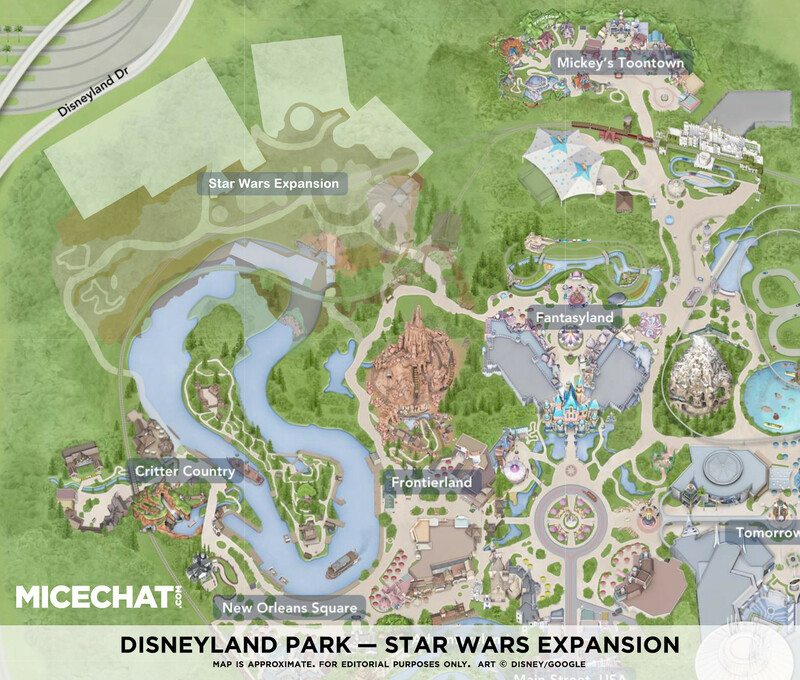 DETAILS: Rumors that Disneyland's major Star Wars expansion would be built where Mickey's Toon Town is currently located were quashed once Disney officially announced Star Wars would be built north of Frontierland. The current rumors for Toon Town suggest that the area is still at risk for reduction or even complete removal to accommodate necessary backstage facilities for the Star Wars expansion. DETAILS: A Star Wars-themed seasonal offering will take over several Tomorrowland attractions starting in November 2015. Hyperspace Mountain: An overlay of Space Mountain featuring a battle with the Millennium Falcon. Star Tours: New scenes based on Star Wars: The Force Awakens will be featured in the attraction. Tomorrowland Theater: A new video presentation featuring fan-favorite scenes from the Star Wars films will be presented. Star Wars Launch Bay: A new interactive exhibit and character meet-and-greet space taking over the bottom level of the former Innoventions building. Jedi Training Academy — Trials of the Temple: A new version of the popular show inspired by the Star Wars Rebels Disney XD series. Disney officially opened Star Wars Season of the Force on November 16. See our photos and review. OPEN DATE: Opened November 16. DETAILS: The MARVEL character meet-and-greets area was reimagined and upgraded on the upper level of the former Innoventions building and opened in November 2015 and was quickly closed April 2. PROJECT STATUS: FACILITY NOW CLOSED. Disney confirmed the reimagined Super Hero HQ at the 2015 D23 Expo and confirmed its reopening date on Oct. 13, 2015. Disney opened Super Hero HQ on November 16. See our photos and review. The facility closed April 2, 2016. It is rumored to eventually reopen as a Star Wars expansion preview center at a future date. OPEN DATE: It is unknown if or when the space will reopen as a Star Wars Land preview center. DETAILS: While Captain EO has likely left the Tomorrowland Theater for the last time, a permanent new attraction for the space is still rumored to come eventually. In the meantime, a Star Wars clip show will entertain guests in the theater. DETAILS: Disney announced a new "Frozen" musical stage show will replace the long-running "Aladdin: A Musical Spectacular" in the Hyperion Theater. "Aladdin: A Musical Spectacular" closed January 10, 2016. The new Frozen musical opened May 27. See our photos and review. OPEN DATE: May 27, 2016. DETAILS: With a major new "Frozen" stage show moving into the nearby Hyperion Theatre, the "Frozen" sing-along show closed. The venue was converted (without the removal of the Frozen theming) into the "Sunset Showcase Theater," a flex-space venue, in May. OPEN DATE: Opened May 2016. DETAILS: The long-rumored Monsters, Inc.-themed remodel of the "Hollywood Studios" portion of Hollywood Land featuring a Monsters Inc. door coaster has been an on-again, off-again rumor for years. The Hollywood Studios area of the backlot is ripe for redevelopment, but current rumors on what may eventually become of the space are scarce and Disney has yet to make any sort of announcement for the area. DETAILS: Rumors for a MARVEL-themed mini land have been circulated by MiceAge for some time, with the expansion taking shape in current backstage space behind the Twilight Zone Tower of Terror. The mini-land is rumored to feature elaborate meet-and-greet areas in addition to a MARVEL-themed E-Ticket rollercoaster attraction. If the Marvel-themed expansion is approved and built, plans for the Monsters Inc. re-theme of the Hollywood Studios areas will likely be canceled. Disney has yet to confirm any plans for MARVEL in Disney California Adventure, but rumors suggest this project could open in two phases: the first just after the 60th Anniversary Celebration ends in late 2016. DETAILS: If the MARVEL-themed expansion is built, Tuck and Roll's Drive 'Em Buggies at the back edge of A Bug's Land could be removed to accommodate the addition of a larger guest path to the MARVEL-themed area. DETAILS: A replacement attraction for the troubled Luigi's Flying Tires is currently under construction on top of the Flying Tires attraction. The new ride utilizes a trackless ride vehicle system. Disney announced that the attraction was set to open in early 2016. The attraction officially opened March 7, 2016. See our photos and review. OPEN DATE: Opened March 7, 2016. DETAILS: The popular Cove Bar is being expanded onto space previously occupied by a character meet-and-greet gazebo. The expansion opened in late-December just in time for the holiday rush. OPEN DATE: Opened in late-December. DETAILS: Announced at the 2015 D23 Expo, the popular Soarin' Over California attraction will be updated with new technology and a new film that will take guests beyond the Golden State and to famous landmarks and locations around the world. Disney has confirmed "Soarin' Around the World" will open on June 17, 2016. "Soarin' Over California" will close on June 15, 2017. OPEN DATE: June 17, 2016. DETAILS: A new 5,000-space parking structure was announced as part of a $1+ billion investment Disney promised if Anaheim passed a gate tax ban. The new parking structure will be built on top of the current Pumbaa parking lot and is rumored to include the addition of a new skybridge over Harbor Boulevard. Disney promised the parking structure as part of the $1+ billion investment plan with Anaheim. There has been no official groundbreaking or construction timeline announced but the deal with the City of Anaheim requires construction to begin no later than the end of 2017. COMPLETION DATE: Rumored to open in 2018. DETAILS: Enhancements including new pavement, trees, and a water feature have been rumored for the Main Entrance Plaza between Disneyland and Disney California Adventure. Additional trees are expected to be installed soon but there is no word on if or when repaving or water features would be installed. DETAILS: The popular House of Blues restaurant and concert venue is planning to move from Downtown Disney to a new home at the nearby Anaheim GardenWalk. There have been no official announcements for a replacement, although rumors suggest The Edison could move into the space. The addition of The Edison to Anaheim's Downtown Disney would follow the footsteps of the popular Los Angeles-based restaurant opening a location in Walt Disney World's Disney Springs. OPEN DATE: The House of Blues' lease in Downtown Disney ends in early 2016. House of Blues is planning on opening at the Anaheim GardenWalk by Summer 2016. DETAILS: A second kiosk location for Starbucks was announced to open in Downtown Disney but was delayed following rumors that Disney requested Starbucks open a second full-fledged store instead of a kiosk. The second store is rumored to fill some of the space previously occupied by the Apricot Lane Boutique near the AMC Theatres. The second Starbucks location is under construction and set to open Summer 2016. Last edited by MasterGracey; 06-01-2016, 04:31 PM. Great job Andy! It's nice to see so many projects underway again in the Disney pipeline. It's going to be a lot of fun watching these rumors and projects develop. Yay! Finally, a new tracker! Is this going to be updated when new information comes, or just stay static? THANK YOU sooo much for doing a new project tracker! News and rumors are a big reason why many of us are here! Very much appreciated! If this follows the patterns of all of the previous project trackers, the information above will be updated when new information becomes available. For me, the best part of these threads is the great amount of imaginative discussion and (hopefully) friendly debate about what any progress details we can see actually mean. Anybody remember the lengthy discussions about the Pillar of Mystery, beginning when the roots of it first appeared as part of the massive makeover at DCA? Something so basic but it elicited so much fun speculation about what it might end up being. The upcoming construction at the northwest end of Disneyland will provide us with 100x more fodder for guesswork and discussion. Update: Hah! I just found this, from a long time ago on another site. Last edited by BiggestDisneyFan; 10-12-2015, 02:30 PM. I really hope they make those changes to the entrance plaza. The look still feels like DCA 2001 and hasn't changed at all. Great to see a new thread! Great to have a new tracker! I look forward to hearing about all of the changes. Strictly supposition at this point for us, but do we think that the Indian Village is doomed along with everything else north of BTMRR? The current "fish jumping" lagoon would seem to be the logical southern boundary and a great tie in point to future pathways. I'm anxiously awaiting our first glimpses of plans as they leak out! Esmerelda says: It is too early to tell. I think be nice also ,to have a new entrance plaza! Wait. So ToonTown is still at risk to make way for backstage storage facilities?? I never heard this rumor. I thought that was the main reason for the purchase of the Manchester properties. I doubt Disney will get rid of ToonTown. Maybe a refurb of the entire land. We shall see. Disney made a statement indicating that ToonTown is safe from being demolished to make way for the new Star Wars land, but the wording was both specifically worded and seemed designed not to say too much. My source has been telling me since before D23 that ToonTown was being demo-ed for a Fantasyland expansion and Star Wars was going to have nothing to to do with the area, so the very particular wording has continued to line up with that. The red area is the transportation center which is the motor pool and gas station. The green area is horticulture. Brown is Circle D, some stables, the Pope house, etc. Blue is the recycling center. The yellow area is the Winston gate. The purple area is the staff shops including paint, mill, metal, and cycle shops. 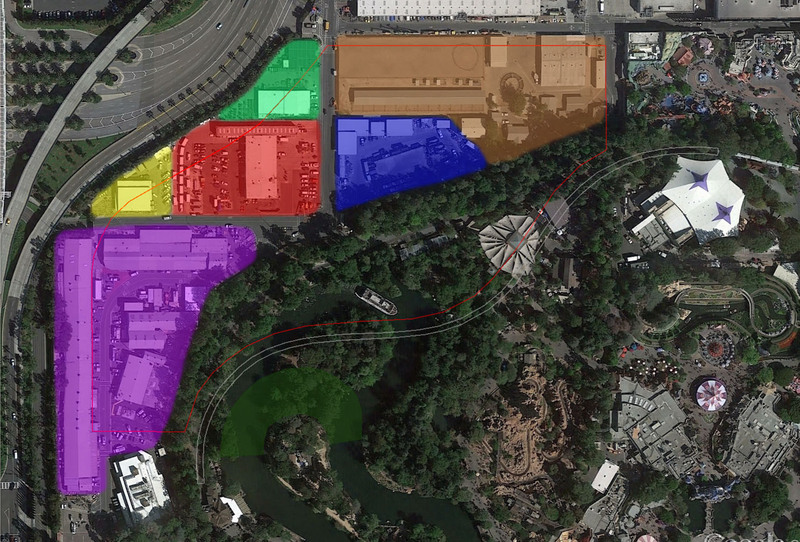 According to someone on another site, his backstage friends say that Circle D (brown), horticulture (green), transportation center (red), and staff shops (purple) will all be moved elsewhere either onsite or offsite. He didn't have any info on the recycling center (blue) but that would have to go if the other ones are removed. Somebody already found a building permit for 5.1 million on the transportation center including demolition work. Hard to say about the Winston gate because the trams still must enter backstage there but it certainly could be reduced in size. That would open up one large space for the new Star Wars stuff. That red line is just a wild guess which adds up to 14 acres. There has to be an access road behind Star Wars Land as well as loading/unloading space. I just left space behind the area that looks similar to the space behind other places in the resort. But no matter how you space things I'd think the Indian village would be toast. I'm still not sure if the train can do this tight of a turn past the Hungry Bear. I'm guessing they'll try to save the Hungry Bear and that turn would help. Last edited by Macro; 10-14-2015, 06:23 AM. Never heard that rumor of Tuck and Roll's being removed to make way for the Marvel mini-land before. Guess it makes sense though to allow walking room and better flow in and out of the area. This lines up much more with what I have heard from cast members. Area being cleared out for Marvel and Toon Town going under the axe. From what I've seen elsewhere, the new Disneyland Railroad route would cut in tighter and go right through the Fantasyland Theater and Big Thunder BBQ. If that is the case and your info on the backstage moves is correct too, that opens up far more than the announced 14 acres for Star Wars. In a bit of pure speculation, I hope that the space between Critter Country and Star Wars is used for a Frontierland Expansion at some point. Would anyone here like to see The Western River Expedition and Geyser Mountain built in this area? The wording in the OP is 'backstage facilities', not mentioning anything about storage, and that's a significant difference. With as big as the new Star Wars expansion will be, and the fact that it may be largely indoors, they may need some exterior facilities for air conditioning, possibly food prep space, etc. I can't really see that taking up much of ToonToown, though. The thing is that ToonTown isn't all that big. If any significant portion of it were to be re-purposed, it would end up being an awkward alcove of a land.